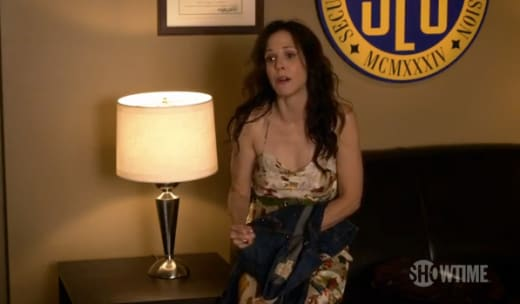 It took a couple of extraordinarily stupid actions, but characters on Weeds finally suffered some consequences on "Cats! Cats! Cats!" Do I believe that Shane would be so ignorant as to think he could break into an officer's computer and simply print out key records? Or that Silas would be so trustworthy of a rival drug dealer that he'd reveal all his secrets? No and no. But I'll take what I can get on Weeds these days and, following this episode, we at least have raised stakes now. Not for Nancy, of course. She may look pained in the photo above, but everything works out perfectly for this non-mother of the year. Over and over, she just stumbles into good fortune. Hey, the CEO you admitted to tapping? Not only did he invite you away with him after one day, he gave you his townhouse! The possibility you might return to jail? Nah, no worries! You happen to work for a company with ties to the government. It's getting more and more irritating to watch Nancy get away with everything each week, mostly because her constant reprieves are never the result of her planning or wit or intelligence. They are truly just dumb luck, which is a lazy way to write a TV series. What happened to Martin Short? Her sister? Stevie? The possibility of losing her son appeared to be the one way in which Nancy was still a vulnerable human being, but we haven't heard a peep about that case in weeks. There are only a few episodes remaining. Let's hope we return to it soon. Then we have Zoya. Wow. What a pointless, random character. We never really learned anything about her, except that she was an insane arsonist with a temper... and then she just up and left. Did any viewer feel invested in this individual? Find her interesting? Worthy of any screen time? 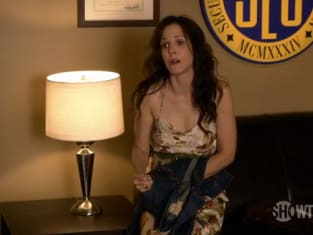 I hate to constantly complain about this season of Weeds, but there's very little coherence to it and Zoya was a prime example. Still, let's end on a positive note: Shane is in jail. Silas is out of business. Stevie is in the arms of his aunt. Maybe, just maybe something will change soon and Nancy will try to right her family's sinking ship.